Sorry for my “spaz-moment” last night. But when I opened up that e-mail, I literally couldn’t stop thinking/saying “oh my God” over and over and over. Needless to say, I attempted getting my thoughts together to form a relatively comprehensive post, but it just wasn’t happening. And instead, I probably confused a good number of you all, too! My mom probably thought I was reading a letter from the dead, as I slammed my bowl of chili to the coffee table and stared at my computer screen bug-eyed and open-mouthed. And believe it or not, my little punk is even registered. Not something that matters terribly to me – but pretty interesting. Anyways. 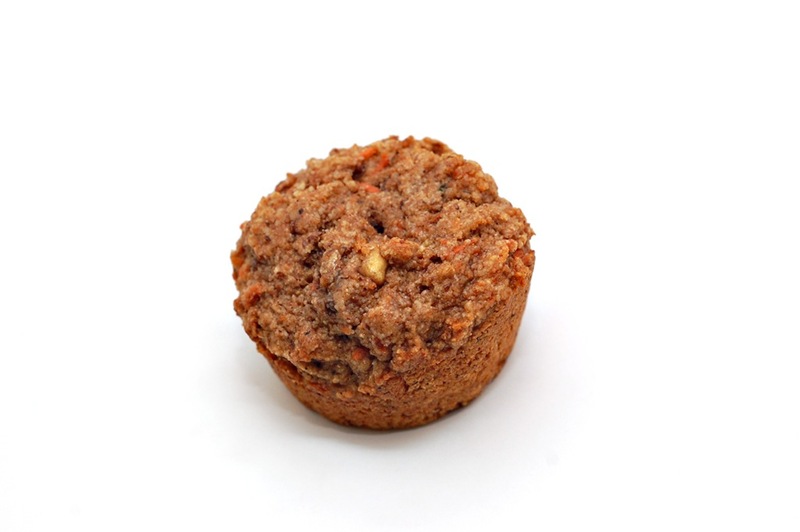 I promised muffins, so I’m here with those graham-carrot muffins I blogged about the other day. Is graham flour anything like graham crackers? Is that a dumb question?? Which made me realize that it’s been far too long since I’ve had graham crackers. ANYWAYS. Back to the matter at hand: graham flour. I would be lying if I said I wasn’t a little disappointed when I investigated my new purchase further, just to discover it was stone-ground wheat berries. Apparently I was expecting stone-ground graham crackers or something. 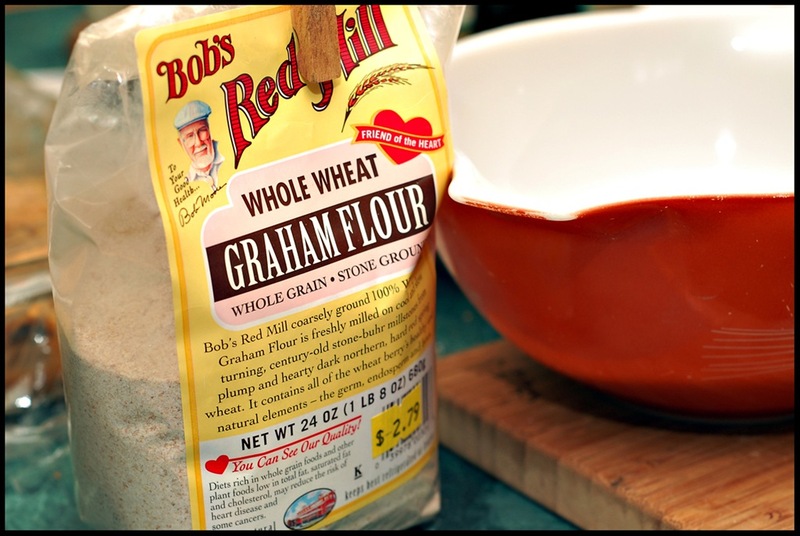 Graham flour is actually named after a person – Sylvester Graham – who was really the backbone of the health food movement way back when it was first starting. 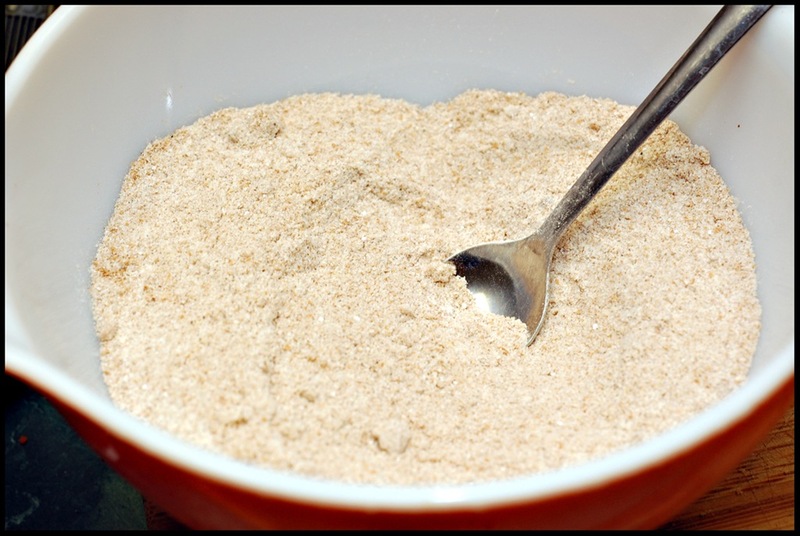 “Graham flour is a form of whole wheat flour made by grinding the endosperm of winter wheat into a fine powder. Both the bran and the germ is mixed back in so the final mixture is, sweet, nutty flavored coarse flour. Depending on the manufacture sometimes the amount of wheat germ is reduced because of the high oil content which makes the flour go rancid faster.” [source] Graham crackers were actually made from graham flour – although nowadays, you’d be hard pressed to find graham crackers that still use this flour. Since it is so whole with the bran, germ and endosperm – it goes rancid quickly, and if you’ve ever read In Defense of Food, you know that refined flour is used most often because it has no nutrients and as such, is far more shelf stable. 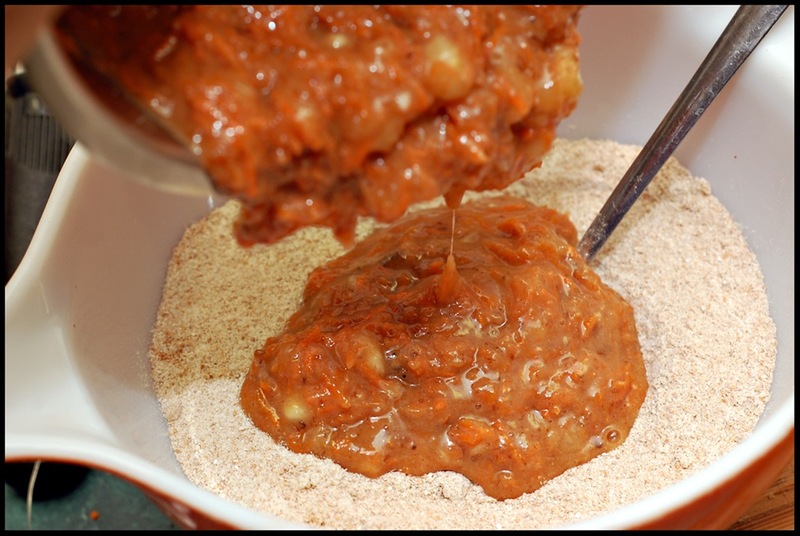 There was one source where Whole Wheat Pastry Flour and Graham Flour is used interchangeably – but every other source treats them as if Graham flour is its own thing. Who knows. Do you know? In my terms – graham flour has sort of a consistency of cornmeal, yet with a flavor just as described…slightly sweet, “graham”-y and nutty. Delicious! I’m an addict. So. History lesson over. Now it’s time for the baking lesson. Just don’t look at me to teach. 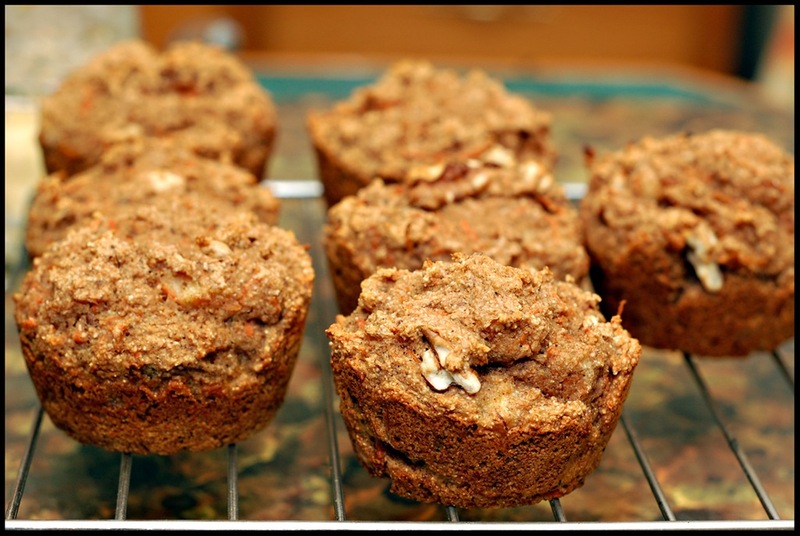 This recipe is a take on Eat, Drink and Be Vegan’s Zucchini Spelt Muffins. The changes are not huge, but I have a feeling the taste is definitely a huge difference! It can easily be veganized with replacing the honey for maple syrup or agave. I’m just tired of having a honey bear sitting in my cabinet. Preheat oven to 375*. In a small bowl, combine flax meal and milk. Mash banana and add it to the bowl along with the grated carrot. Combine well. Add in honey, vanilla and oil. Stir to combine. 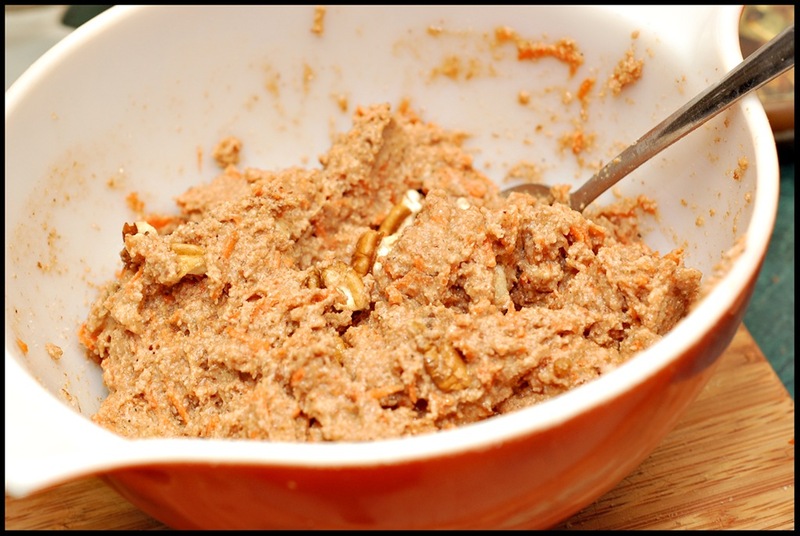 In a separate larger bowl, combine remaining ingredients except for pecans, sifting in the baking powder and soda. Stir until combined. 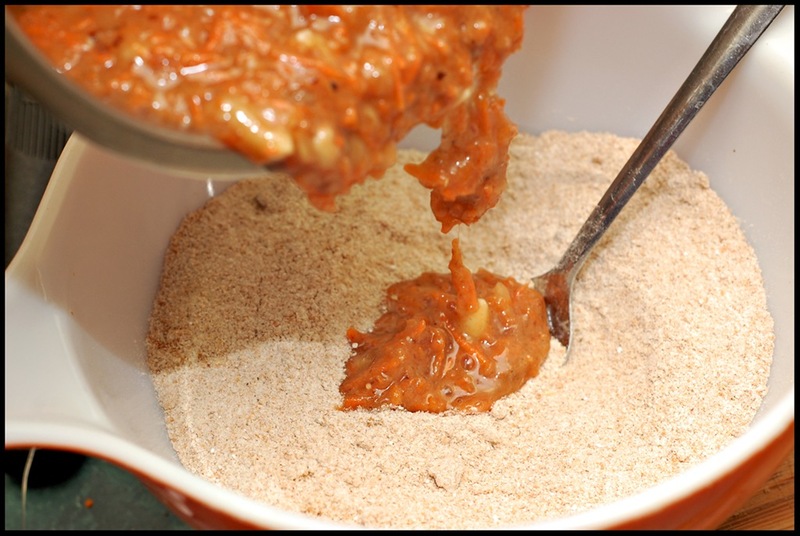 Add wet mixture to dry and stir until just combined. Fold in pecans. Spray a muffin tin with non-stick spray, and fill muffin cups to 3/4s full. Smooth tops (better than I did, at least) and bake for ~22 minutes, or until toothpick inserted in center comes out clean. Is ‘spazz moment’ an appropriate phrase to use online? Is it as insulting in US English as it is in UK English? Maybe it has a different meaning in the US. Those look absolutely amazing! I love carrots and those muffins scream fall! I think you described it dead on! I love graham flour, but my list of flours is so long in my pantry/freezer…I think brown rice flour is very similar in consistency too, but not quite flavor. These sound delicious as always! they look delicious! and graham flour sounds so fun to bake with! I want those muffins! I want to SCD them, but I am afraid of cooking disaster. They look delish! I always thought graham flour was something like ground up graham crackers too! I must say… I’m slightly disappointed. 😛 I used to love graham crackers with honey! These look excellent, love the pecans in there. After those smores cookies I made a few weeks ago, I’ve been kind of obsessed with grahams. I had graham flour for a long time and made homemade grahams with it before but have run out since then..I’ll have to buy some more because these sound delicious! 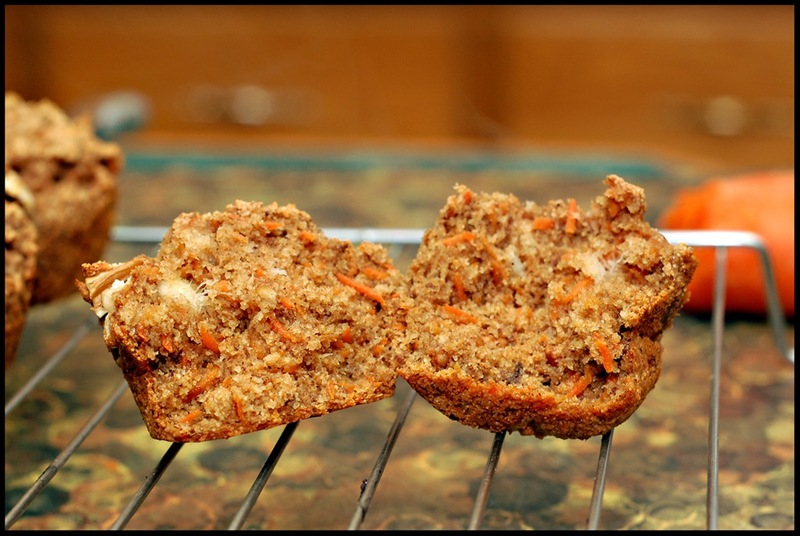 Great recipe – thanks for sharing – i just love carrot muffins and the addition of graham flour sounds intersting!!! Loving those muffins! They look delicoius!